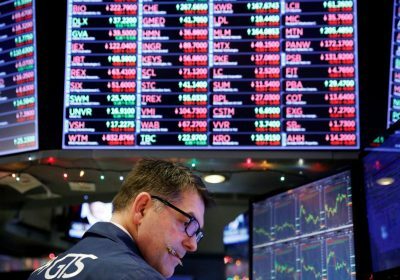 (Reuters) – Wall Street was set to rise at open on Wednesday, indicating a slight respite after a punishing few sessions that left the S&P 500 on the brink of bear market territory on worries over slowing growth and the recent drama in the White House. S&P 500 e-minis ESc1 were up 0.85 percent at 8:48 a.m. ET, a day after the Christmas holiday. Dow e-minis 1YMc1 were up 0.7 percent and Nasdaq 100 e-minis NQc1 were up 1.16 percent. The benchmark S&P 500 .SPX has lost 7.7 percent in the past four sessions, ending Monday at a 20-month low and 19.8 percent below its all-time closing high, just shy of the 20-percent threshold that commonly defines a bear market. The Dow Jones Industrial Average .DJI is off 18.9 percent from its closing high, while the Nasdaq .IXIC is pushing deeper into bear market with each day’s declines. The S&P and the Dow have fallen about 12 percent for the year, while the Nasdaq has shed 10 percent, with just four more trading sessions left to wrap up the year.